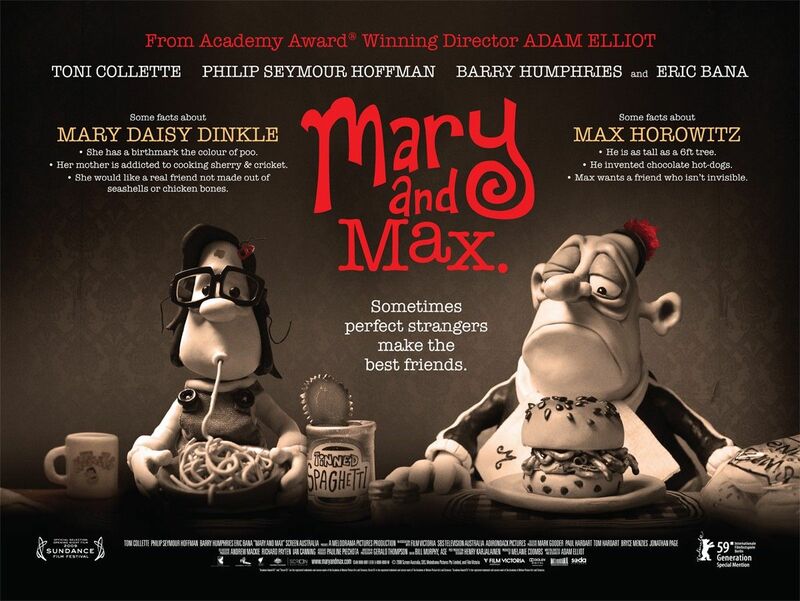 Directed by Adam Elliot, Mary and Max is a Australian clay-animation/black/comedy/drama film. Exploring the basics of friendships and the reality of mental illness (as corny as both of those sound), this is definitely a film to put on your lists. The movie is set in 1976, the main character is an eight year old girl by the name of Mary Daisy Dinkle. She’s growing up in the suburb of Melbourn, Australia and feeling the pressure of being a little different compared to the rest of her classmates (she has a noticeable birthmark on her forehead) and from living in a low income household. To add, her parents offer no support- Her father is distant and her mother is a kleptomaniac,who drinks way too much. Fortunately, she’s not totally alone. She has a neighbour who suffers from anxieties of going outside and getting mail. That’s pretty much the extent of any positive human contact this little girl has. Until the day she decides she needed a penpal. She found a New York city phone book, and chooses a name at random. Her finger lands on a man named Max Jerry Horowitz. He’s a 44 year old, obese Jewish man with a bucket full of mental problems, including various anxieties and eating disorders. Mary writes the first letter and Max happily replies and agrees to become penpals with this little girl. Under any other circumstance, the general public would have a problem with a young 8 year old girl, finding companionship with a 44 year old man on the other side of the world. But the fact that Max lacked the mental capability and Mary needed a real, honest connection- the viewer forgot about the social norms and enjoyed the friendship for what it was. The two bounce letters back and forth. Mary asking increasingly personal questions as the time goes on. The questions about the real world gives Max even bigger reactions and new anxieties, eventually leading him to be committed to a mental facility. There, he was diagnosed with depression and Asperger Syndrome. This gives the clarity Max needed for how to deal with his life and he then resumes his letter writing to Mary. The correspondence lasts for decades. Leading Mary to study psychology and researching about Aspergers. Eventually writing a book, marrying her childhood sweetheart and having a baby. All that crashes (well, except the baby part) and Mary goes into a depression that involves too much drinking. Something inspired by her Mother. The last bit of the film, the relationship between Mary and Max is not perfect and needed some healing on both parts. The ending of the film, is heart retching and the viewer is overwhelmed by emotions. Even me, remembering and reviewing the events in my head, my eyes are watering. I always return to this film. It was recommended to me by a bitchy penpal from Israel- THANKS AVIV!